Gerstenberg & Agger A/S was founded in 1901 by the two engineers Aage Gerstenberg and Christian Agger. Since 1916, the Gerstenberg family was the sole owner of the company, which in the first few decades primarily earned its money as consulting engineers. In the subsequent decades Gerstenberg & Agger A/S specialised in the development, production and installation of equipment for the food industry, and at the end of the century the company was the leading manufacturer of food processing plants in the world. In 2004 Gerstenberg & Agger A/S acquired Schröder GmbH. The year after the two companies merged all main activities and transferred them to the new subsidiary Gerstenberg Schröder A/S which was sold to SPX Flow Technology in 2010. In 2013 a new subsidiary to Gerstenberg & Agger A/S, the company Gerstenberg Services A/S, was formed to provide future and former clients with new products and spare parts. Gerstenberg & Agger A/S is owned and operated by Knud Aage Gerstenberg, who bought the family company in 1981 and also owns the ultimate holding company KAG Holding and the subsidiary A&S Gerias and partly Gerstenberg Services A/S. 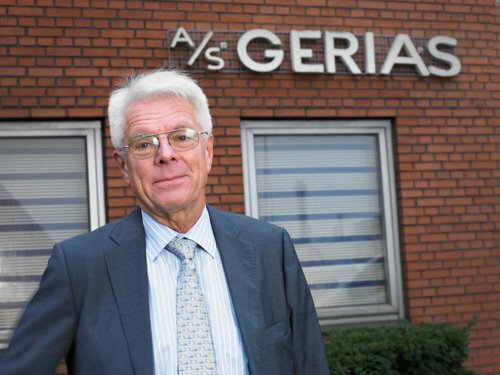 Besides the job as CEO of Gerstenberg & Agger A/S Knud Aage Gerstenberg is Chairman of the Board of Gerstenberg Services A/S as well as board member of a number of companies and foundations. 1901: Aage Gerstenberg and Christian Agger establish G&A as a consulting engineering company. 1923: G&A manufactures the world's first reliable flake-producing single drum for the production of margarine. 1932: G&A obtains a patent for the COMPLECTOR - a continuous vacuum-kneading machine for both table and industrial margarine. 1940: G&A becomes the first company in the world to introduce hard chromium plated chilling drum surfaces for scraping off chilled fatty products. 1956: G&A introduces the first reliable tubular chiller - the PERFECTOR. G&A also opens its first factory, A/S Gerias Maskinfabrik. 1956: The BULLDOG knife gets patented. The knife system ensures clean scraping due to the constant centrifugal force affecting the heavy knife holders. 1965: G&A introduces continuous tubular chilling lines. These can be connected directly to fully automatic, synchronised bulk packing machines. 1968: The MAYONATOR is invented - a Scraped Surface Heat Exchanger that works continuously to heat and cool high-viscosity products. 1970: G&A designs complete processing plants for margarine production. 1985: G&A opens its second production facility, GandA maskinfabrik A/S. 1987: G&A invents the FLOW DIVIDER, primarily for directing a product flow to several packing machines simultaneously. 1991: G&A introduces the INVERTER, to ensure a stable water-in-oil phase in low fat spreads. 1992: G&A introduces the FC-60 packing machine. Computer controlled, this machine features a 'flying cut' device for multiple block and slab sizes. 1993: G&A develops the high pressure, low-noise aseptic plunger pump with a maximum capacity of 14,000 l/h and a maximum design pressure of 160 bar. 1995: G&A develops the RAZOR knife system, which ensures high durability, easy maintenance and faster CIP cycles. 1997: G&A introduces the new JUMBO PERFECTOR with a capacity of up to 18,000 kg/h. 1999: G&A launches the next generation of sophisticated packing machines in the FC series - the FC:2000. 2000: G&A acquires the Consistator® series of light- to medium-duty Scraped Surface Heat Exchangers. 2001: G&A celebrates its 100 year anniversary and launches an updated version of equipment for mayonnaise and salad dressing. 2004: G&A acquires Schröder GmbH and dominates the world market of Scraped Surface Heat Exchangers. 2005: Gerstenberg Schröder A/S is formed as a subsidiary of Gerstenberg & Agger A/S. 2009: G&A acquires ENVIPOWER. 2010: SPX acquires Gerstenberg Schröder A/S. 2013: Gerstenberg Services A/S is formed to take care of spare parts and new products.